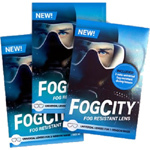 FogCity fog resistant lenses offer a carefree dive with perfect sight. The adhesive lenses stick inside the mask preventing fog build-up and allowing you a much clearer view throughout your dive. Lenses come in three types; one window, double lens medium and double lens large. Because this lens carries the best fog resistant properties on the market, it's even used by the Navy 'special forces'.